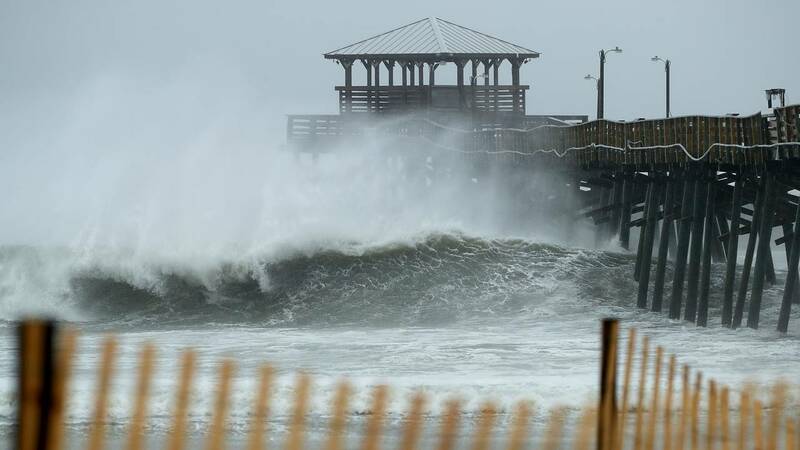 Waves crash underneath the Oceana Pier as the outer bands of Hurricane Florence begin to affect the coast on Sept. 13, 2018, in Atlantic Beach, N.C.
(CNN) - Wind often gets the headlines, but water is most responsible for deaths in a hurricane. Water has accounted for more than 75% of all hurricane-related fatalities in the US from 1963 to 2012. Wind, on the other hand, is only responsible for 8% of all deaths. That's why Hurricane Florence is still an incredibly dangerous storm -- it will contain extreme amounts of water, both coming up from the ocean in storm surge, and falling from the sky in heavy rain bands. About half of all deaths in hurricanes come from storm surge. Even though Florence has weakened to Category 2, it will contain a storm surge more like a major hurricane thanks to its massive size and slow movement. Florence is forecast to slow down to a jog-like pace as it moves near the coastline, which will allow two full tidal cycles to push high tide 5 to 10 feet above normal. The slow pace will also create incredible rain totals of more than 20 inches over portions of North and South Carolina. According to stats compiled from Weather.us meteorologist Ryan Maue, about 17 trillion gallons of rain will fall over the Carolinas, Georgia and Virginia. More than 1 in 4 deaths in hurricanes come from inland flooding, which often catches people by surprise, as it can occur several hundred miles from landfall.